When you are accustomed to Wireshark’s filtering system and know what labels you wish to use in your filters it can be very quick to simply type a filter string. However if you are new to Wireshark or are working with a slightly unfamiliar protocol it can be very confusing to try to figure out what to type. The “Filter Expression” dialog box helps with this. 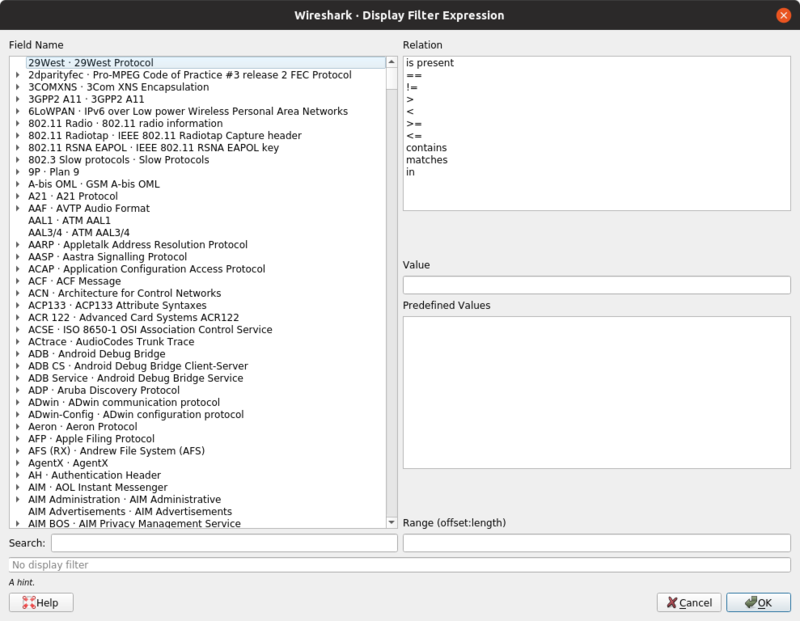 The “Filter Expression” dialog box is an excellent way to learn how to write Wireshark display filter strings. When you first bring up the Filter Expression dialog box you are shown a tree of field names, organized by protocol, and a box for selecting a relation. Select a protocol field from the protocol field tree. Every protocol with filterable fields is listed at the top level. (You can search for a particular protocol entry by entering the first few letters of the protocol name). By expanding a protocol name you can get a list of the field names available for filtering for that protocol. Select a relation from the list of available relation. The is present is a unary relation which is true if the selected field is present in a packet. All other listed relations are binary relations which require additional data (e.g. a Value to match) to complete. When you select a field from the field name list and select a binary relation (such as the equality relation ==) you will be given the opportunity to enter a value, and possibly some range information. You may enter an appropriate value in the Value text box. The Value will also indicate the type of value for the field name you have selected (like character string). Some of the protocol fields have predefined values available, much like enum’s in C. If the selected protocol field has such values defined, you can choose one of them here. A range of integers or a group of ranges, such as 1-12 or 39-42,98-2000. When you have built a satisfactory expression click OK and a filter string will be built for you. You can leave the “Add Expression…​” dialog box without any effect by clicking the Cancel button.